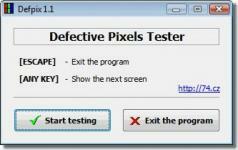 Defpix is a lightweight tool that allows you to easily test your LCD display for dead, stuck or hot pixels, also providing support for multi-screen setups. The application is portable which means there is no installation required and your system Registry will not be modified in any way. Defpix comes with a functional interface that can be used by beginners and power users alike. To start the test simply click on the dedicated button. During the test, the application will display primary colors on your screen(s), specifically red, green, blue, black and white which allows you to quickly spot dead, stuck or hot pixels.